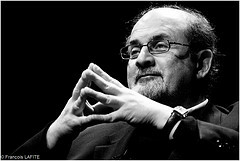 Salman Rushdie will offer a lecture at Emory University’s Glenn Memorial Auditorium on Sunday, February 22nd. The subject of the lecture will be Adaptation, or how art is translated from one form to another. Tickets are only 10 dollars (5 for students), and Rushdie, who is currently Emory’s Writer in Residence, is always warm, engaging, and very funny at these events. If you live in or near Atlanta, it will definitely be worth your time. In the translation industry, the term adaptation is used to refer to work done with marketing and advertising material, which has to go beyond word-for-word translation to ensure that a message transfers appropriately to another culture. Rushdie, who began his career writing advertising copy, recently signed off on a film adaptation of his Booker of Bookers winning novel, Midnight’s Children, which has also been adapted for the stage. It should be interesting to hear his take on the process.